This middle distance forest walk which undulates through a mixture of mature Douglas Fir, broad-leaved wood, clear-felled areas and forest tracks. The waymarked walking trail passes a derelict smallholding, one of a number of similar ruins throughout Brechfa Forest. These are a poignant reminder that more people used to live off the land here. Mountain bikers of all abilities can enjoy the woodland, too, as there is a trail for beginners and families and a black route for proficient riders. Derwen green (easy) grade Trail (5.7 miles, 9.2 kilometres). 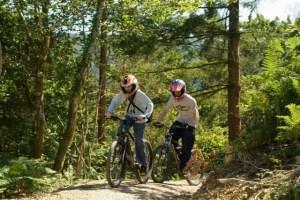 Typically, green trails are all on forest roads or canal towpaths - but not in Brechfa Forest! Named after the oak woodland it effortlessly flows through, the Derwen trail gives the inexperienced off-road rider a unique introduction to the world of mountain biking with some steady climbs and fun descents. Derwen Trail blue (moderate) grade extension (2.6 miles, 4.2 kilometres). This an extension to the green Derwen Trail which you join halfway along the green route. It then climbs a steeper bank before taking in a long, fast descent and rejoining the green trail to return to the car park. Raven Trail black (severe) grade (11 miles, 18.2 kilometres). This trail was designed by Rowan Sorrell and Brian Rumble, who are well known in the mountain biking world. Suitable only for proficient bikers, the trail takes goes out into the more interesting corners of the forest. It mixes up the more traditional narrow woodland singletracks with some brash descents and fast, undulating trail between trees, into berms and over jumps. Byrgwm is two miles north-east of Brechfa village on the B4310. From the A40 between Llandeilo and Carmarthen, take the B4310 towards Brechfa village. The nearest station is in Carmarthen. More information in relation to whether or not they are suitable for you and where you can get training can be found on the Natural Resources Wales website.